Convocation is a tradition at Old Dominion University (ODU) that welcomes the freshmen class into the Monarch community each August. The students are greeted by the president, faculty, and staff. Each new student receives a graduation pin with their class year. 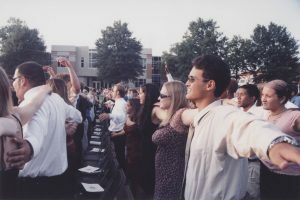 In the early days of the Norfolk Division of the College of William & Mary, convocations referred to any formal ceremony and there were several each year with a guest speaker. As early as the 1950s, each freshman at the division would be given a duck cap, or beanie, at freshmen orientation to wear indicating they were first year students. The orientation would include remarks by the director or president, a picnic lunch, and a tour of campus. In 1971, ODU began the Preview program, which allows students to tour the campus each summer and get a sense of what college would be like. The first official Convocation took place in 1994 with an address from motivational speaker Ben Bissell. Mace & Crown, Old Dominion University, Norfolk , Va.